Don't worry about a robot with a needle — it draws blood better than humans do. Your blood is like the Cliffs Notes to your health. It can tell a doctor everything from how well your organs are working to whether you need to add more iron to your diet. So it’s no surprise that blood tests are one of the most common diagnostic procedures in the world. And now, researchers from Rutgers University have created a robot that can both draw and test the blood. Automating the process makes it both faster and cheaper.They detail their new invention in a study published in the journal TECHNOLOGY. Though it’s common, the act of drawing and analyzing blood, known as phlebotomy, isn’t easy. The practice requires specific training and equipment, and because doctors don’t always have the necessary training or equipment themselves, they often send their patients to labs specifically focused on blood testing. This can increase the time between when a doctor first sees a patient and has the information to diagnose their health issues. That’s where Rutgers’ blood-testing robot comes in. The system contains three separate parts. The first is a “venipuncture robot.” This robot locates the patient’s blood vessels using near-infrared (NIR) and ultrasound imaging. Then, it reconstructs the vessels in 3D using image analysis. Finally, it inserts the needle right into the center of a vein. The analyzer itself contains an acrylic chip that houses the blood sample, a centrifuge that separates the blood into its various parts, and an optical microscope system that determines the cell count. 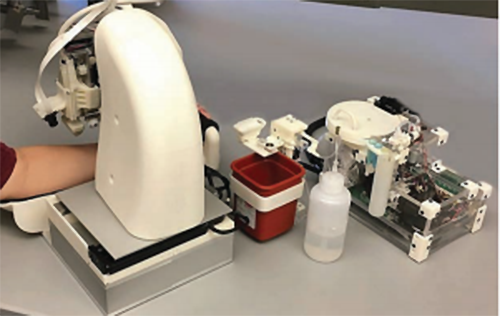 The Rutgers team set their system up to replicate the two most common blood tests in the U.S.: a 3-part white blood cell differential and hemoglobin measurement. In 30 trials using artificial arms fitted with skin made of gelatin and plastic blood vessels, the venipuncture robot was able to puncture the vein with 100 percent accuracy. According to a press release, the analyzer produced “highly accurate” results in tests using a “blood-like fluid” containing fluorescent microbeads designed to represent white blood cells. “With our relatively simple chip design and analysis techniques, the device can be extended to incorporate a broader panel of tests in the future,” he added. 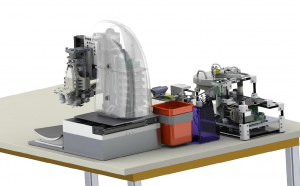 So, while the idea of a robot drawing your blood might not be any less distressing than having a person on the other end of the needle, take comfort in knowing this blood-testing robot could give your doctor easier access to the health information flowing through your veins. Users Can’t Stop Taking Antidepressants. Why Don’t We Know More?